Like many two- or three-story homes, our house has a "bonus room" over the garage. I suppose the name indicates that this space isn't really necessary for the functioning of the house, but if you have kids, it's definitely a "bonus" to have this extra space! As you can see, we have a big garage--which means we have a big bonus room built into the eaves under the roof there. Our bonus room has been well-used in the seven years we've lived here, but until now it's never been decorated. It's mostly been the place where old furniture goes to die--stuff that won't be hurt by teenagers hanging out, doing the things that teenagers do. But now that we're down to just one teenager living at home full-time, this room doesn't have to be quite as tough as it used to be. Time for some decorations! And here's a view looking back the other way. The room re-do started when I found this "Architect" rug in a colorway that I knew would go with our old couch. The rug is big enough to anchor the seating/TV/video gaming space (6'6" x 10"), and it was on clearance for 69.98. It hopped right into my cart! Now, are these the most up-to-date colors in home decor? No. I think that's why this rug was on clearance. But do they work well in this space used mostly by teenage boys? You bet! I found a fabric that went well with the rug and the sofa and made some new throw pillows. Easy and inexpensive update. We had the Swedish armchair; it got a new throw pillow but otherwise remained the same. To round out the seating area, I made over some roadkill rescue chairs. A little black spray paint and some new fabric go a long way toward a new look for almost no money. You can see in this photo that the narrow end of the room is a stage. We bought this house when it was under construction. Upon looking at the footprint of the bonus room, my husband asked our builder if he could elevate that portion of the floor to make a stage. At that time our oldest son Will was in 8th grade and was in a couple of bands; the stage made a great place to practice and perform. Now that Will is 21, he's not at home very often. So his instruments and equipment have moved to one side to make way for Lee's LEGO studio. Here he films LEGO review videos for his YouTube channel. The artwork for the stage was a simple DIY project: I mounted LEGO shopping bags onto foam core and popped them into black frames that I had on hand. Easy and free! A lamp from Target and three square mirrors from IKEA are just right for the short wall above the piano. 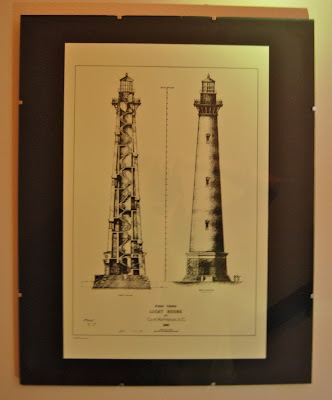 For the stairwell leading to the bonus room, I used architectural prints of the lighthouses of North Carolina. 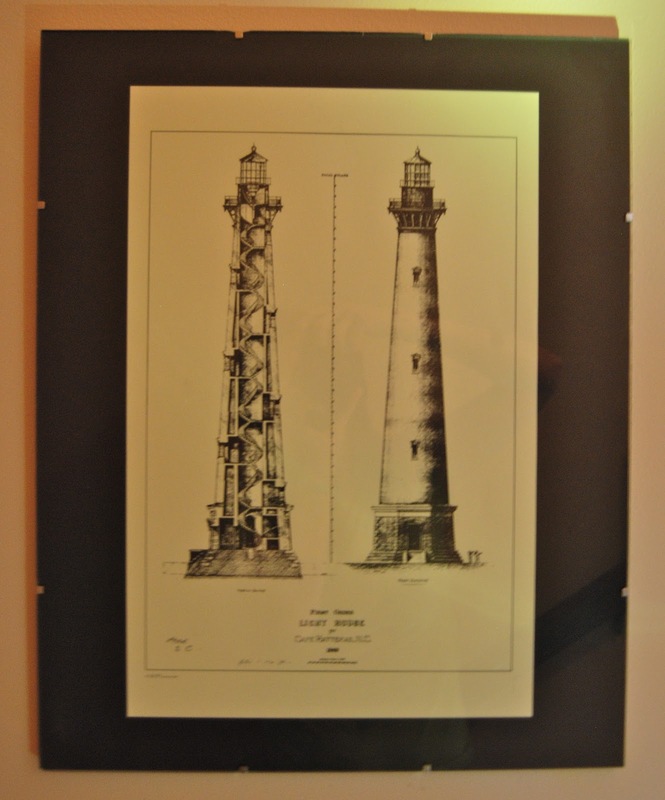 These came from the Bodie Island gift shop and cost about $3.00 each unframed. I used double-sided tape to mount them on black paper and slipped them into clip frames. They're hard to photograph in this space, but I love the way they look! And now for my one splurge in this room. Some time ago a friend gave me a beautiful print (a copy, not an original) of an architectural drawing of the 1984 renovations on the Statue of Liberty. 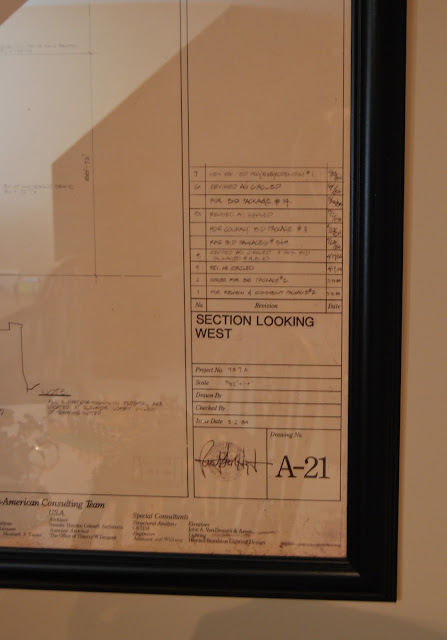 To go with this room's building/architecture look, I had the print framed. This baby is 36 inches x 42 inches, so it's definitely a special piece! Isn't it cool? It's in a little nook at the end of the room. When this table is not covered with a LEGO display, it's a great place for board games. We've had teenage boys here playing Trivial Pursuit until 2:00 A.M. Those are the times I'm grateful for a bonus space--this room is all by itself over the garage, so there's no noise in the rest of the house! Now for my very favorite part: the cost. Even with lots of new touches in this room, I spent a total of only $300 on the makeover. Many things I already had on hand; I just pulled things together to work in this space. That makes me happy! Thanks for taking a tour of my bonus room! What do you think? What a great space, Richella! Ours is the official "man cave" in the house. It also sits over a 3-car garage and is a great bonus space! I love how you have designated different spaces and your decor is wonderful. Great job on your make over! Looks like a fun space with lots of room for fun activities. I think it would be really great to have a space like that someday for the kids to play in. I love all the artwork you found. wow! what a great, multi functional, space! 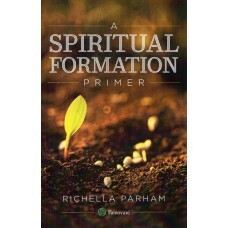 Richella...I think it is wonderful! A perfect place for your boys to hang out with friends over the years. And maybe someday (if you're still in that house) a great place for grandkids! We had attic rooms in our other house before we moved here, that had a play room for the grandkids when they were little...and then when they were older they lied the basement room with the pool table. You have such great ideas for decorating...and you do so much for free or very little money! That's great. I used to be more like that when I was younger. I am glad you have your beautiful home, and that you appreciate it, and use it for hospitality! What a great space! "Where furniture comes to die"... love that! I so relate! I'm also drowning in lego-land-opulous and I have bruised feet to prove it! The lego bags in the frames is SO FREAKING SMART! Love that idea. And what a great space for kids to just hang out. Perfect! What a great space! So, so, soooo envious of all that fantastic play space. I love the makeovers you gave the chairs. :) Good job, Richella!! Love the cozy bonus room. It's a wonderful place for anyone to hang out. Thank you for sharing. Is that the print from Thomas? Erin, YES! Isn't it wonderful?? I'm so proud of it. I still can't believe he gave it to me. Such a kind gift! This looks lovely! And what a luxury to have so much space for a bonus room. I'm totally envious. I love all the separate spaces. So useful. And only $300 for such a large room? I'm impressed. What a great room - all those Legos make me very happy! Very nice. I really love the idea of using the Lego Shopping bags for art work. That's a great tip! I love this bonus room, Richella! It's so spacious and looks so inviting. I hope to have a space like that some day for my boys. I know they would love it. Those roadkill rescue chairs you re-did are fabulous! Great job, girl!